You cannot have your cake and eat it. You cannot have television for the masses and retain the esoteric qualities of a sport. Formula 1 has been confronted with this choice for thirty years now and has generally chosen the mass media option. The incidents of racist abuse against Lewis Hamilton in Spain were an inevitable result of the broadening of the appeal of the sport and the abandonment of its core source of support, the petrol heads, anoraks and aficionados that delight in the minutiae of F1. Although we may not be aware of it, this week has seen an intensification of the battle for F1 that is evidenced by any number of apparently unrelated items in the media, particularly the internet. As examples, I want to refer to Doctor Vee's article on Journalists, bias and comments, Oliver White's post on How Long a Race Should Be on his excellent BlogF1, Keith Collantine's article on F1 Fanatic regarding Bernie Ecclestone's latest appearances in the Daily Mail newspaper, and, again, F1 Fanatic's poll on F1 versus NASCAR. Doctor Vee's article is important and relevant because it focuses our attention upon the fact that the great majority of people are unused to and therefore incapable of reasoned debate. While this is probably exacerbated by the degeneration of the education system, it has always been true; a quick read of some of the graffiti on the walls of Pompeii will confirm this. The plain, terrible and unfortunate truth is that only a minority of the population, any population, has the tools to participate meaningfully in a debate. It is no accident that most political discussions consist of unsupported statements masquerading as facts, together with gratuitous slurs on the character of those who hold the opposite opinion. Rare indeed is the political commentator who can rise above such pointless reiterations of prejudice to see the wider picture, the good and bad in both sides. Traditionally, F1 has drawn its support from that minority that can find pleasure in learning the intricacies of the sport. And I will be honest and admit that there is a certain elitist satisfaction that comes from understanding the nuances; in previous and related articles, I have been careful to avoid pointing this out but my American commenters have been quite open in their recognition of how their love of F1 sets them above the common run of their countrymen. So F1's core of support comes from a minority of a minority - those few amongst the educated who happen to have an interest in motor sport. Their appreciation of the detail, the excellence of the engineering and the skill of the drivers, that is what keeps them coming back for more and, incidentally, allows the majority to see them as geeks and fanatics. Bernie's agenda has been to broaden the base of F1 interest, primarily to increase television viewing figures and, as a direct result, the price he can charge the broadcasting companies who wish to televise the show. Note the use of the word "show" there. At the moment that television becomes involved, F1 begins to depart from its original purpose, competition between teams and drivers for the sake of being the best, and becomes part of the entertainment industry. Ollie's post on BlogF1 is just one of myriads of articles on the net that discuss how this shift from sport to entertainment affects F1. In this case, he is talking about the length of races but virtually every aspect of the sport comes under scrutiny daily in the quest to make "the show" better. It is in the comments to his post that we see the effect of the broadening of F1's fanbase most clearly. Remember that most of Ollie's readers will be of the true enthusiast variety; only they have the drive to seek out information on their chosen obsession to the extent of reading blogs - the casual fan is content with his daily newspaper or television. And it should come as no surprise that almost every commenter would rather the races were longer than shorter, if they have to be changed at all. Although the only reason for changing the length of races would be to suit the convenience of television, none of those who watch the races only and spend the rest of their time elsewhere are represented. They have better things to do, no doubt. This is indicative of the situation we have today. Bernie keeps plugging away at extending F1 TV viewing figures and the sport supports him in this by discussing how the show can be improved. F1 has become used to the huge sums of money generated by its venture into the world of entertainment and has an appetite for more. And so the sport becomes the slave of the media, always chasing the ratings and trying to present itself as sensational rather than a fine wine to be enjoyed only by the connoiseur. The terrible thing is that those who control the direction of the sport do not seem to understand this. "I hate democracy as a political system," Ecclestone says. "It stops you getting things done. I think people should have decisions made for them." Yet nowhere do I see a realization that he becomes the servant of the masses at the moment he seeks to engage their interest. He has placed F1 in the position of having to change itself to suit the TV audience. We are all aware that money is the motivation behind the need to spread support for F1. Without that money, the developments to the cars and circuits seen in the last decade would never have been possible. Enormous numbers of viewers are necessary to support the advertising that pays for the sport. And the fanbase spreads ever wider, taking in large segments of that majority who are not interested in learning the complexities of the sport but who come to support their national heroes without appreciation of the skills of others. It is a small step from nationalism to racism; indeed, I would maintain that they issue from the same source, but that is an argument for another time. Suffice to say that, once one sees F1 as a battle between nationalities, it is inevitable that the opposition will be seen as worthy of contempt and any aspect of a competitor to one's hero will be seized upon for ridicule. The Spanish fan who said, if Hamilton had been fat or a woman, that would have been the focus of those who abused him at the Barcelona test, was entirely correct - xenophobia knows no bounds of decency or common sense. The sad fact is that broadening the base of F1 support must include those who are incapable of seeing it as a contest between engineers and drivers in which nationality is both irrelevant and impossible to sort out anyway - each team has members from many different countries and the over-riding criterion is excellence in performance of a task. The vast majority of viewers will see only that their countryman is winning races and must be supported therefore. And woe betide anyone who stands in his way. F1 is a sport that is being tugged in many different directions but the most important for the future is this battle between entertainment and sport. To see the future if entertainment were to win, one has only to glance at NASCAR. Have a look at Keith's poll on the subject (inevitably dominated by F1 fans since it is conducted on a F1 site) and read the comments. You will be left with an impression of a form of motor racing that has sold its soul to television, that has given its all to ensure close racing and constant overtaking, those two factors most often cited as what is missing from F1. NASCAR is the motor sport of the people and has its reward in the ratings. The model is there for F1 to follow. 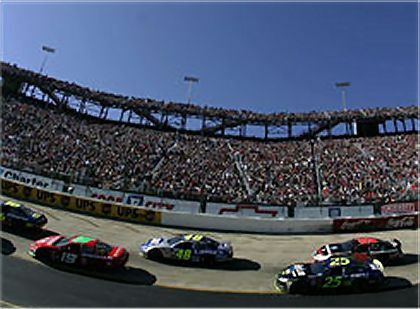 NASCAR is the motor sport of the people and has its reward in the ratings. The model is there for F1 to follow. The long explanation ........ NASCAR racing (regardless of the type of car or circuit) is still the sport of the PEOPLE. There's more cars, more teams, more sponsors, more races, more fan PARTICIPATION, and the DRIVERS are the draw! And NASCAR hasn't sold itself to TV, it races are 500 miles or 400 miles or 250 miles and if there are several yellow flag situations that expand the expected TV time ....... NASCAR preempts the other meaningless drivil and the race (and TV coverage) continues! Qualifying is not a TV 'show', it race qualifying. Racing is RACING. Most everything about NASCAR is generally upbeat and there are no "young driver programs" which I'm convinced is a short fall of F1. Too many "kids" think they deserve an F1 seat whereas young NASCAR drivers are more likely to EARN their seat. And NASCAR drivers LAST a LONG time. In F1 we tire of our better drivers and drive them out. We litterally ran Michael Schumacher out of town and yet having not driven for 18 months he got in the new Ferrari and "topped the charts". Many wanted Fisichella run out including Bernie! Barrichello and Coulthard are on the short list? WHY? These are amoung our best drivers, just stuck in poor cars! NASCAR has opened up to accept Toyota and have introduced the "CoT" (car of tomorrow). Like it or not NASCAR is moving forward, MadMax is dragging F1 backwards. MadMax and Bernie are temporary, have faith, time heals all wounds. I, too, focus on your last words, Number 38, and have to hope that you are right. Let Max and Bernie fade into history and let new minds guide F1 through the maze to a better tomorrow. The problem with Max and Bernie's version of F1 is that the least important people are the fans who genuinely understand and care about it. Bernie has often commented that whatever they do we will watch. So long as Bernie's bank balance is the overriding factor in the major decisions that direct the sport the land grab attitude will prevail. Until we reach a point where fewer people switch on their televisions on a Sunday that attitude will not change. Unfortunately Bernie's business model is becoming prevalent in the major sports around the world. The NFL played a regular season game at Wembley to grab the British audience. No thought for the people who have bought season tickets for years and have had one of there games taken away. The NFL plan to repeat the Wembley game next season and intend to expand into other countries. To Hell with the core fans. The English premier league intend to add one game on to their league season and have each of those ten games played in foreign - mainly Asian - countries. Since the league began well over 100 years ago each team has played every other team in the league twice: once at home and once away. Now a random game is going to be added purely for financial reasons. The purity of the competition which has been sacrosanct will be thrown in the gutter. The US single seater championships have also run a number of races far from their historical base. Rockingham in England and Lausitzring in German have both held races and Surfers Paradise in Australia and Motegi in Japan are still on the schedule. Unfortunately Max and Bernie have shown no ability to make the sport more transparent to the unitiated fan. I always end up coming back to the technical regulations. If we had cars where we could understand what the driver was doing and which promoted wheel to wheel racing a lot of the problem would disappear. All the nonsense at Hungary last season was caused by a set of technical regulations that mean each team has to slightly favour one driver strategically and as overtaking is so difficult in F1 in general and Hungary in particular any perception of bias in those strategies gets blown out of all proportion. If we had proper technical regulations that promoted racing Alonso and Hamilton would have battled it out on the track and people would have enjoyed the battle and not become bogged down on who broke what agreement etc. The fundamental principle in sales is to give the custome what they want. Bernie wants the customer to do his bit but has no interest in supplying the product the customer wants to watch. I think it was David Richards who once said that Nascar is like a hamburger from McDonald's, while Formula 1 is like caviare. You are bang on when you say that F1's appeal is elitist in nature. It is a geekier sport compared to Nascar, and it has a completely different audience, just as in the same way that The Sun compete for a different kind of reader to the Telegraph. In fact, I have in the past argued that F1 should give up on trying to attract American fans for this very reason. If F1 were to move towards becoming a more Nascar style sport, it would lose sight of where it has its competitive advantage. What is the appeal of Nascar? Is it driver skill or engineering excellence? Of course not. It's big crashes. If people want crashes, that is fair enough -- Nascar is there for them. If people want to revel in the jaw dropping skill of the world's best drivers and engineers, F1 is the place to be. They might as well be two completely separate sports. There is no point in F1 trying to plant its flag on Nascar's patch. This is not to say that I think that F1 should not try to broaden its appeal. After all, I am not a petrol head in the true sense. I have never been to a motor racing event in the flesh at all, period. I have only ever watched it on the television. If I didn't think it was an exciting television spectacle when I was younger, I would never have got into F1. But at the same time, I appreciated the nuances of F1 far more than I will ever be able to understand the appeal of Nascar. When JPM jumped state side I tried to watch NASCAR...irritating stupid inane commentators, constant breaks for ads and very dull racing. If the NASCAR direction is the answer to F1's future the wrong question is being asked. As usual, Steven, I can do little but agree with you. There is no doubt that the rulebook has become so intricate and compicated that even FIA delegates cannot find their way through its twists and turns (it takes an Alianora to do that!). But I do think that F1 should pay far less attention to television than it does. Before Bernie, the races were televised and we saw a growing fanbase as a result - yet nothing was done to dramatise the show. It was good enough in itself to be gripping. If we allow the sport to develop in a natural way, taking note only of what the competition requires, its attraction for viewers will remain. They may be different viewers in that they will understand what is going on and not be swayed by simplistic nationalistic leanings, but they will be there and they will stay. Thank you, Doctor Vee. I agree that F1 is exciting enough a sport to gain fans purely through the TV - after all, I see most of it through the good offices of the tube, just as you do. But pandering to the lowest common denominator is not the way for it to go, especially in America. The special and esoteric nature of the sport should be emphasized, not played down, so that an interest in it will become evidence of good taste. It will always be like that (at least until Max makes all the cars the same) and we should capitalise on that fact, not be ashamed of it. The American fans (and there are many, I assure you) know that and it is shameful the way that Bernie has treated them. I tried very hard to get into NASCAR racing at about the same time as you, AJH. I found it almost incomprehensible, a learning curve that frightened me. I would have to learn a new language to appreciate it fully. Read a NASCAR blog and tell me you understand it - if you do, you're a better man than I am. The racing is straightforward enough (although I cannot tell one car from another usually - no wonder they refer to them by their numbers) but it's the culture that surrounds it that baffles me. Perhaps it is the same for a NASCAR fan encountering F1. I did once follow it, however - way back in the days when Richard Petty was the king. Strangely, although that was when it was supposed to be good ole boy culture, I found it much easier to understand than the present offering. I prefer to watch motor racing in which the cars turn both left and right. I have mentioned it before on here, but here in Oz we have our own touring car series called the V8 Supercars. I think it's a bit of F1/ NASCAR hybrid, as well as being unquiely Australian. If you ever get the chance to watch any of it, I think some of you guys would really enjoy it. The tracks are proper track layouts like in F1, but there is a lot more argy bargy and wheel to wheel racing like NASCAR. There are usually about 30 cars on the grid, and it is not elitist like F1. I met last years entire driver lineup - some of them more than once which says something about their accessibility. And most of the drivers are friends too - sure they fight on track but off it is another story which is an attraction to me. No Alonso/Hamilton type spats in V8's ! I remember watching one race from a few years ago when one of the drivers had a massive accident - a barrel roll which seemed to go on forever. Half of the other drivers got out of their own cars & ran over to help him - even before the race was red flagged. You don't see that sort of camaderie in other series, I am afraid. The cars also have the innovations which make it onto road cars that are made locally - as per F1. And although the money men dabble in V8 Supercars - they don't yet run it, which has to be a big plus. I actually think Bernie & Max could have a look at the way our series is run and learn a lot from it. Sure there are a few ups and downs, but it is a racing series, and no one involved in it ever loses sight of that. The V8's will be at the Melbourne GP this year - if any of you get the extended coverage then take a look at them. On another note - just to make you all jealous - one of the TV channels here is making a special show on the F1 drivers on the wednesday before the GP and I GOT TICKETS to be in the audience ! Woo hoo ! "At the moment that television becomes involved, F1 begins to depart from its original purpose, competition between teams and drivers for the sake of being the best, and becomes part of the entertainment industry." Maybe I'm just quibbling over semantics here, but doesn't sport necessarily have to be entertainment in order to survive? If it were just about competition for the sake of being the best, it would interest no one except the competitors. As you alluded to in your post, a sport as technological as F1 needs a lot of money. I don't think you can cater to a minority of a minority, and still pull in that. An excellent post, Clive. It was an interesting read. Back when the internet was young I run into a group of NASCAR fans in a chat room. Their passion and friendship was very infectious and they were very welcoming of a young Brit (and F1 one fan - aka 'The enemy') and keen to get me interested in their sport. I bought a satellite dish as at the time Eurosport were showing the races live and got into it. It was very exciting and I, as an F1 fan, loved it. I followed it through till the end of the season, chatting away with my 'friends' online about the previous races and getting inside info that you could only get from the local press. The following season started, I watched a few races and it occured to me that it was really really BORING! Round and round and round for hundreds of miles. Yes, close racing. Yes big crashes (I don't like them, personally). And yes lots of different winners. But I prefer the same thing on a 'real' course. A 'road' course as the NASCAR chaps would say. But NASCAR doesn't work on road courses. V8 Supercars, however. It's how our Touring Cars should be. In fact, I'm sure I remember a golden age of British Touring cars when they had LOADS of power! RS500, M3. [sigh]. Personally, my favourite form of racing over the last few years has been WTCC -if only they'd give them bigger engines and STOP MESSING with the drive penalty weight nonsense. Really pressed for time this morning - deeply involved in assisting with the creation of an online F1 magazine (more on that later, no doubt). Replies will be brief, therefore - my apologies. Arnet: Don't we all? NASCAR has its attractions but I think Europeans find it hard to enthuse over oval racing. Peril: I have heard only good things about the Australian V8 Supercars series - there is no doubt that there are lessons to be learned there. If only F1 had the administrators who were prepared to learn. Congrats on the tickets! Rohan: All sports start as contests between competitors without an audience - but I agree that some viewers are necessary before it can be elevated beyond that personal stage. F1 has become so popular that it would probably be impossible to return to the "special interest" stage of development. My point is really that it does not need to adjust itself to pull in more viewers - it needs to develop in a way best suited to itself and let TV find its own methods of presenting it. Trying to improve the show only makes things worse. DBT: You make a point that I was going to mention and then forgot to include - NASCAR should be compared with touring car races rather than with F1. F1 is far better positioned as a specialist interest than as straight "who can go fastest" motor sport. This bit of prose has touched me. I had to stop reading the comments after Dr Vee. So please forgive me if I repeat something that is already said. As a red blooded American who loves F1 I think that the reasons for how NASCAR is percieved by us "elitist" is not unique. I feel that most American F1 fans are somewhat like myself. I am now 44 years old and have loved openwheel racing since I was a child. My father still thinks that racing is for rednecks. I think that was the reason for me to like another form of racing besides NASCAR. I was willing as a young boy to agree with Dad about NASCAR but not racing. I used to watch the tape delay broadcast of Indy. It was always on the same day as the race at 11:30 at night, and until I was a teenager I could only watch until 12:00. Dad would only give me 1/2 hour to watch something that I enjoyed even more than football. ABC would then broadcast Monaco on their "Wild Worl of Sports" And this is how I was introduced to F1. I was able to watch only two abbriviated races a year until I was 16. I was the only one of my friends who liked openwheel racing. Most northerners did not think racing was a sport at the time. They thought it was a thing like entertainment similar to professional wrestling. So for a person such as myself I did feel somewhat different. I emersed myself in everything I could read about "my" sport. When I began to meet people who enjoy "my" sport, I noticed that they acted and felt the same way. Because we did not get much coverage for our sport we would take what the papers and networks would give us. As NASCAR's popularity climbed CART rose on it's shirt-tails. Thus "my" sport was becoming more popular. I enjoyed schooling new fans and to bring them out of the dark and into the light. You see Clive for us American fans we are just not used to getting what we want when it comes to openwheel racing F1 or otherwise. I read the blogs because I feel that you guys know more then me about the sport. I feel how you feel from your writings. But also as the sport became harder to find (after the split) the internet exploded and became my highway for information. The ambivilance and social elitist feelings that Americans fans I feel are related to the way we discovered "our" sport. Part of the problem is that Bernie pulled a fast one, selling the rights to F1 to CVC Capital Partners for an enormous sum. CVC are now determined to milk F1 for all its worth - to ensure they can pay back the interest on the money they borrowed to buy the sport from Bernie - and sadly, that means chasing every last dollar. Whether that's through dumbing down or extracting cash from dodgy dictatorships wishing to improve their international image through hosting an F1 race. Only too true, Patrick - not helped by the fact that CVC made a $3 million loss last year. Although that doesn't stop me from feeling that they deserve it for being so greedy.